Lavant in Dusky Blush is available now to try on. 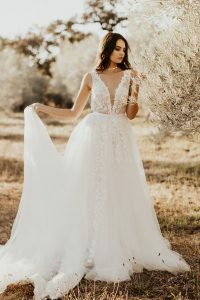 This modern take on the traditional ball gown is opulent and romantic, without being frilly or fussy. Lovingly hand-crafted, this gown flatters almost all body shapes. The bodice is a traditional, form-fitting shape with a deep V neck and light boning for support. Exquisite hand-cut Sakura petals cover the bodice and cascade over the skirt. At the waist, a narrow band emphasises your curves, while layers of fine ivory tulle form a full, sweeping skirt and train.